A teacher should teach what is new by resurrecting what is old. Most people today never become truly educated — even if they graduate from college. Colleges today emphasize vocational training instead of education in the humanities. Even students who focus on the humanities usually acquire only specialized knowledge, not broad education. This book brings together the various branches of the humanities — literature, history, philosophy, psychology, religion, etc. — and combines them into a unified whole. It introduces you to the classics of many different fields, and it also introduces you to the people who created those classics. Chapter 1, “Philosophy,” describes the Philosophy of Today, a philosophy that relies on intuition rather than reason, feelings rather than logic, and dreams rather than syllogisms. The Philosophy of Today takes a non-rational approach, and also believes that reality itself is non-rational, hence it’s receptive to the occult. The Philosophy of Today is influenced not by the rational philosophers of ancient Greece, but by Eastern philosophy, by Jungian psychology, and by sages from all cultures. The Philosophy of Today is spiritual as well as intellectual. While the Philosophy of Today is first discussed in Chapter 1, later chapters explore it further; for example, Chapter 12, “Physics,” shows that the Philosophy of Today is consistent with modern physics. Besides discussing the Philosophy of Today, Chapter 1 discusses the analytic approach to philosophy that is popular in academia, and contrasts this approach with the approach of Montaigne, Thoreau, and others. Chapter 1 describes the origin of philosophy, the aim of philosophy, and the history of philosophy, paying special attention to Schopenhauer, Nietzsche, and Jung. Chapter 2, “Ethics,” discusses meditation, Zen, and the influence of Zen on Japanese culture; it also discusses the Zennish thinking of Thoreau. Chapter 2 sketches the history of moral thinking, from Socrates to Jung, and describes the attempt to set up universal standards of right and wrong. Chapter 2 discusses the impact of culture on people’s values and people’s lives, it discusses the interplay of culture and ethics. Chapter 3, “Religion,” begins by reviewing atheist arguments, and ends by going “beyond atheism” — looking at new approaches to religion, new definitions of God. Chapter 4, “Psychology,” begins by discussing occult phenomena, and later discusses birth order, social class, national character, the psychology of adolescence, and other subjects. Chapter 4 ends by discussing the importance of psychology in modern thought — the importance of the Psychology Revolution that Freud started, and Jung continued. Chapter 5, “Genius,” enables you to see the classics from the inside, to meet the people behind the books. But it does more than introduce you to writers and artists. Genius is a subset of human nature, just as neurotics are a subset of human nature. Freud focused on neurotics, but his conclusions were relevant to mankind as a whole. Likewise, when we explore the psychology of genius, our conclusions throw light on man in general. Chapter 6 gives you an introduction to psychology, to Freud’s work, and to the whole modern movement toward exploring the unconscious. One well-known Chinese scholar, Dong Leshan, said that the chapter on genius is the best piece he has seen on the subject of genius. Chapter 6, “Sundry Thoughts,” discusses a variety of subjects, including Chinese painting, the sadistic side of human nature, and the cult of leadership. Chapter 6 also includes a biographical sketch of Kierkegaard and a new view of Hitler. Chapter 7, “Literature,” attempts to describe the essential features of major writers — Joyce, Proust, Tolstoy, Kafka, etc. Chapter 7 also discusses the major philosophical questions surrounding literature, such as the purpose of literature, why people enjoy tragedy, and whether literature is subjective or objective. Chapter 7 returns to the subject of the Philosophy of Today, arguing that the Philosophy of Today resembles the so-called Hermetic worldview, and sketching the history of the Hermetic worldview. Chapter 7 also argues that Shakespeare’s worldview closely resembles the Philosophy of Today. Chapter 7 looks at Eastern philosophy, discussing Zen thinking in Whitman and Forster. Chapter 8, “Education,” looks at academia, looks at the controversy surrounding the identity of Shakespeare, and looks at how academia handles this controversy. Chapter 8 pays special attention to the views of Twain and Whitman on the Shakespeare controversy. Chapter 8 also discusses the life-enhancing function of culture — that is, how culture can stimulate us, and arouse in us an appetite for living. Chapter 8 argues that academia often overlooks the life-enhancing function of culture, and it discusses two writers who emphasized this life-enhancing function, Bernard Berenson and Kenneth Clark. Chapter 9, “Language,” discusses how the migration of Asian peoples into Europe (the so-called “Aryan migrations”) shaped the development of European languages. Chapter 9 also discusses the origin of language, the origin of surnames, and the differences between the Chinese language and European languages. Chapter 11, “Politics,” discusses rationalism in politics and theology. Chapter 11 also discusses Islamic fanaticism, and the spiritual crisis in the Islamic world. Finally, Chapter 11 discusses the causes of the Iraq War, and causality in general. Chapter 12, “Physics,” discusses the connections between modern physics and the Philosophy of Today, and argues that we’re now able to create a synthesis of the sciences and the humanities, Western thought and Eastern thought. Chapter 13, “Life- and Death-Instincts,” discusses the biological side of philosophy. It discusses Schopenhauer’s idea of a will to life, Nietzsche’s idea of a will to power, and Shaw’s idea of a life force. It discusses Freud’s theory of life- and death-instincts, and argues that this theory resembles Nietzsche’s theory of decadence. Chapter 13 introduces the reader to the theory of history that is set forth in Chapter 14, and shows how this theory of history differs from earlier theories of history, such as those of Spengler and Toynbee. Like other chapters, Chapter 13 discusses the history of ideas. Chapter 13 describes how my theory of history was influenced by earlier thinkers, how it synthesizes earlier thinkers. Chapter 14, “Decadence and Renaissance,” sets forth a new theory of history. This theory predicts that there will be a renaissance in our time, the first renaissance in four hundred years. It is our destiny to be alive during a renaissance epoch. This renaissance is beginning now, when people least expect it, when people see only decadence and sterility. Chapter 14 argues that a renaissance is bound to occur when decadence reaches an extreme. 1. Fresh View People sometimes assume that philosophy is a body of knowledge, and that the student of philosophy begins to acquire this knowledge as a freshman, and finally masters it as a PhD student. I would argue that philosophy isn�t a body of knowledge, and most philosophers never earned a PhD in philosophy. We should view philosophy, not as a body of knowledge, but as knowledge in general, or as the love of knowledge�phil (love) + sophos (knowledge). A successful philosopher is not one who adds something to a body of knowledge. Rather, a successful philosopher takes a fresh view of the universe in general, reality in general. Thus, a philosopher�s theory doesn�t fall within one department; rather, it sprawls across multiple fields, it sprawls across knowledge in general. 2. Decathlon Analytic philosophy, which is popular in academia, divorces philosophy from the rest of the humanities, and treats it as a separate subject. On the other hand, the Philosophy of Today joins philosophy to the rest of the humanities. Philosophy is a synthesis of the humanities. Philosophy is to the humanities what the decathlon is to track and field. Philosophy is not a subject, it is all subjects. It is the art of arts, and the science of sciences. It deals with everything under the sun — and a few things over it. 3. Practical Philosophy The Philosophy of Today emphasizes the inner life, spiritual growth, and the art of living well. It doesn’t treat philosophy as a purely intellectual exercise; rather, it stays close to life itself. During the Middle Ages, philosophy no longer advised people how to live. Religion began to play the role that philosophy used to play. Philosophy was reduced to playing the role of “handmaid of theology.” Philosophy was no longer relevant to life; it became enmeshed in logic and in the process of thinking, like analytic philosophy today. During the Renaissance, many people had more respect for Greco-Roman culture than for Christianity. Philosophy was no longer the “handmaid of theology,” it resumed the role that it had in ancient times. One Renaissance philosopher, Montaigne, restored the ancient tradition, tried to understand the world, and discussed topics relevant to life. The Philosophy of Today is even more practical than Nietzsche, even less interested in logic than Thoreau, even less abstract than Kierkegaard, even closer to life than Montaigne. The Philosophy of Today draws on the tradition of Jung and Freud, a tradition that stays close to life, a tradition that points us toward self-knowledge. We admire the Buddha, who advised his disciples not to be distracted by intellectual questions, but to focus on their inner life. And we admire those Zen sages whose approach is un-intellectual and un-bookish, those Zen sages “whose doctrine was in their dress and bearing and general manner of life rather than in their speech or writing,” those Zen sages whose wisdom manifested itself in arts and crafts and sports rather than in syllogisms and definitions. 4. Lifeless Philosophy Academic philosophy has become preoccupied with language, with the process of thinking, and with the process of ascertaining truth. These topics have no bearing on life; they neither deepen our understanding of reality nor give us advice about how to live. If you ask a process philosopher to discuss the goal of life and the goal of the state, he’ll say, “First we have to define our terms. What do you mean by ‘goal’? By ‘life’? By ‘state’?” Soon the process philosopher will be enmeshed in a semantic net, and he’ll ask you to come back in a week. When you come back, he’ll say, “I’m making progress with my definition of ‘goal’, but I haven’t yet begun to define ‘life’ or ‘state’. Come back next week.” A week later, he’ll say, “I now realize that I don’t have a clear idea of what a definition is. Before I go any further, I have to define ‘definition’. Come back next week.” After hearing this, you’ll realize that you asked the wrong person, that a process philosopher can neither deepen your understanding of reality nor give you advice about how to live. Since process philosophy doesn’t deal with reality, it has no role outside academia. Philosophy should leave the classroom, enter the world, and address the great questions that every human being wants answers to. Philosophy should address questions of substance, not just questions of process. When philosophy concerns itself exclusively with process, it becomes sterile, hollow and empty, and this is what academic philosophy has become. Process philosophers want to eject philosophers like Thoreau from philosophy, and force them to seek shelter in literature or history. Thoreau discussed values, as a genuine philosopher always does; the process philosopher, on the other hand, doesn’t discuss values, doesn’t discuss how people should live. Thoreau lived his philosophy, he didn’t just discuss it in the classroom and make a living from it; for Thoreau, philosophy was a way of life, not a job. Hence Thoreau will always be read by the layman, he’ll always have a place in the world, while the process philosopher will always be ignored by the layman, and will have a place only in academia. 5. Living Philosophy Montaigne speaks openly about sexual pleasure, and also about the pleasure of eating and drinking. This is because France, during Montaigne’s time, was little influenced by ascetic Protestantism, and little influenced by the Counter-Reformation. Montaigne was a product of the Renaissance, and he shows how close the spirit of the Renaissance was to the spirit of ancient paganism. Christianity had far less influence on Montaigne than ancient culture had. Emerson was shocked by Montaigne’s treatment of sexual matters; Emerson said, “a gross, semi-savage indecency debases [Montaigne’s] book.” A comparison between Montaigne and Emerson shows how profound the effect of ascetic Protestantism was, even on one who, like Emerson, was removed from it by several generations. A comparison between Shakespeare and Milton also shows the effect of ascetic Protestantism; Shakespeare, a Renaissance spirit, speaks far more openly about sexual matters than Milton, a Puritan spirit. Montaigne is the most popular of philosophers — everyone likes him. Emerson, for example, though he deplored Montaigne’s “indecency,” said of Montaigne’s essays, “no book before or since was ever so much to me as that.” When Flaubert received a letter from a woman who was depressed, he wrote her thus: “You ask me what to read. Read Montaigne.... He will calm you... You will love him, you will see.” Nietzsche praised Montaigne for his honesty, and then said, “the joy of living on this earth is increased by the existence of such a man.” Pascal, who was a devout Christian and was tormented by a scrupulous conscience, wondered at Montaigne’s untroubled conscience and his love of life. But Pascal didn’t dislike Montaigne. Has anyone ever disliked Montaigne? Montaigne was still popular in the twentieth century; Montaigne was a favorite of the twentieth-century American philosopher, Eric Hoffer. Why is Montaigne so popular? Montaigne is honest, personal and intimate; he takes the reader into his private thoughts, and into his personal experiences. Montaigne treats literature as a form of friendship; Montaigne said that one of his purposes in writing was to communicate with kindred spirits and form friendships. Montaigne discusses such fundamental topics as education, death, truth, friendship and love, and he illustrates his remarks with quotations from ancient writers. (Montaigne’s enthusiasm for learning and his penchant for quotations are typical of the Renaissance.) Montaigne doesn’t represent a particular school, party or theory — he writes as a human being, for human beings. Montaigne doesn’t concern himself with questions of process, and he has no interest in logic or metaphysics. Montaigne gives us philosophy without sophistry. 7. Who’s a Philosopher? When Thoreau was alive, and was publishing articles on wild apples and Mt. Katahdin, who regarded him as a philosopher? When Kierkegaard was becoming known through his writings on Mozart and French drama, who regarded him as a philosopher? The best philosophers are often not regarded as philosophers until long after their death. Furthermore, the best philosophers often have little interest in The Great Philosophers. Nietzsche, for example, had little interest in Aristotle; he was far more interested in Wagner’s operas and Dostoyevsky’s novels. Montaigne was more interested in Virgil and Tacitus than in Augustine and Aquinas. Thoreau paid little attention to Kant and Hegel; he preferred to read about an expedition to find the source of the Nile, or about a voyage to the South Pacific. But Nietzsche did read Schopenhauer closely, and Thoreau did read Emerson closely; philosophers like Nietzsche and Thoreau may have little interest in the history of philosophy, but they have a keen interest in One Philosopher, and their work takes this One Philosopher as a starting point. 8. One Reader The philosopher writes primarily for one reader, one disciple. This reader resembles himself, is himself at a younger age, himself transplanted into the future. This reader is the only person who fully understands the philosopher’s work; he’s the philosopher’s best critic, and he can surpass the philosopher, and raise philosophy to new heights. Thus, Aristotle was Plato’s best critic, and surpassed Plato, while Nietzsche was Schopenhauer’s best critic, and surpassed Schopenhauer. 9. Jung The most important philosophical thinker of the twentieth century is Jung, but he isn’t yet recognized as a philosopher, he isn’t given a chapter in the history of philosophy, and he isn’t discussed in academic philosophy departments. Much of Jung’s work explores that essence of life which Parmenides called Being, which Kant called the thing-in-itself, and which Schopenhauer called the Will. Schopenhauer had said that the Will is blind and aimless, like a dog chasing its tail; Schopenhauer was pessimistic. But Jung said that the unconscious has a goal. Jung said that the unconscious contains archetypes (images, patterns), and the most important of these archetypes is the archetype of the self, which draws us toward wholeness and balance, as the North Pole draws a compass needle. Jung said that the archetype of the self is identical with God; whether we refer to it as “the archetype of the self” or as “God” is a matter of choice. Jung wasn’t pessimistic, as Schopenhauer was; Jung sees opportunities for spiritual growth. While Schopenhauer and Nietzsche were contemptuous of religion, Jung respected the religious tradition, and Jung points the way to new religious ideas. While Nietzsche said “God is dead,” Jung says that God evolves, as the human mind evolves. Jung didn’t draw a sharp distinction between mind and matter. He thought there was a connection between mind and matter, between man and nature, between the inner world and the outer world. An archetype, in Jung’s view, was neither purely psychic nor purely physical, it was both, it was “psychoid” (to use Jung’s term). Just as the Romans saw a connection between the flight of birds and the outcome of a battle, just as the Chinese saw a connection between an earthquake and the death of an emperor, so too Jung saw connections between the human world and the natural world. He referred to these connections as “synchronicity” — that is, meaningful coincidence; he called synchronicity an “acausal connecting principle.” Jung was fascinated by occult phenomena of all kinds, and believed that these phenomena deserved further study. Kant had said that space, time, and causality are merely categories of the human mind, and pertain only to the world of appearance, not to the thing-in-itself. Occult phenomena violate the laws of space, time, and causality. Schopenhauer and Jung, who both studied Kant, tried to explain occult phenomena in terms of the relativity of time and space. For example, when one of Jung’s patients shot himself, and Jung felt a pain in the back of his head, he viewed that incident in the light of Kant’s theory. You can perceive something that’s taking place far away because it isn’t really far away — space is relative, not absolute. When Jung had a vision of World War I before the war started, he said that the future can be foreseen because it is prepared in advance — time is relative, not absolute. Jung’s ideas often agree with ancient beliefs, and also with Eastern beliefs. Jung’s ideas also agree with those of Western alchemists. Like Jung, the alchemists believed that the psychic and the physical overlap. The alchemists spoke of unus mundus, one world, the union of matter and spirit. They also spoke of “subtle bodies” (or “breath bodies”), which are part physical, part psychic. The concept of “subtle bodies” has been used by Jungians to explain psycho-somatic phenomena in the field of medicine. The power of the mind is boundless; the mind can not only effect changes in the body, it can also effect changes in the external world. As one alchemist put it, the mind can bring about “many things of the utmost profundity outside the body.”5 Mind and matter overlap; there is no “pure spirit”, divorced from matter, and there is no “dead matter”, lacking all spirit and energy. The whole universe is suffused with energy, with a kind of consciousness. It will be many years before Jung is discussed in academic philosophy departments. Jung deals with the invisible world, the mysterious, while academics prefer to deal with what can be set forth on a blackboard; Jung deals with the non-rational, while academics are dedicated to rational thinking; Jung deals with the occult, while academics avoid the occult, and regard it with a mixture of fear and loathing. 10. Zen Like Jung, Zen represents an important part of modern thought, a part that is neglected in philosophy departments. Zen is highly practical, and speaks directly to one’s values, and to one’s daily life. Zen isn’t bookish or abstract, and it can’t be put on a blackboard. One can’t grasp Zen by reading about it, one must practice it, and feel it. Zen has the positive, affirmative attitude that one finds in Nietzsche, the mistrust of reason that one finds in Jung, and the feeling of kinship with nature that one finds in Thoreau. Like Jung, Zen points the way to spiritual growth, and to new religious ideas. 11. Manifesto The Philosophy of Today is both a religion and a philosophy; it satisfies both spiritual needs and intellectual demands. It has given up on traditional religion, monotheistic religion. It doesn’t believe in a Creator God, a Ruling God, a Judging God. But it also is wary of atheism because it believes that the universe is suffused with energy, power, mystery, even a kind of consciousness. Thus, it isn’t exactly atheist, and it isn’t exactly theist; one might say that it defines god in a different way, or calls god by a different name. The Philosophy of Today is akin to Eastern worldviews, such as Zen, insofar as those Eastern worldviews are both a philosophy and a religion, and those Eastern worldviews are neither atheist nor theist (in a Western sense). The Philosophy of Today heals the rift that has sundered philosophy and religion since the time of Descartes. Religion has long been based on faith and revelation, while philosophy has been based on reason. But our religion isn’t based on faith, and our philosophy isn’t based on reason. We’ve brought religion and philosophy together, and we base both of them on intuition, feeling, and experience, as well as reason. Instead of separating feeling and reason, we try to make man whole, and we try to develop a worldview that satisfies the whole person. Thus, the Philosophy of Today is akin to the Renaissance philosophy of Bruno and Pico, which was a religion as well as a philosophy. Just as that Renaissance worldview tried to calm the storms that were raging between Catholics and Protestants by going past religious formalities, so too the Philosophy of Today hopes to bring people together by emphasizing the common essence that is shared by many religions. The Philosophy of Today respects the spiritual core of all religions, as Bruno and Pico did. We don’t dismiss religion as madness or superstition, as Nietzsche and Freud did. We believe that the most fundamental distinction in philosophy is the distinction between rational and non-rational philosophy. Greek philosophers pioneered the rational approach, and were as fond of it as a child is of a new toy. They rejected mythology, and expelled the poet from their ideal republic. We take a different approach. We believe mythology expresses deep spiritual truths, deep psychological truths, truths that rational thinkers overlook. Likewise, we believe that the poet expresses deep truths. We believe that one sees the world best when one’s eyes are half closed. We agree with Bruno that Aristotle isn’t the prince of philosophers, and we agree with Bruno that philosophy should embrace literature, art, etc. A non-rational approach to philosophy unites philosophy with other branches of culture, whereas a rational approach leaves philosophy by itself. The rational approach is only popular with academics, but the non-rational approach appeals to both the intellectual and the “man on the street.” One of the most popular philosophers of our time is Joseph Campbell, who took a non-rational approach, and explored the wisdom of myths, and the wisdom of the East. We don’t believe in ethical rules, we aren’t interested in categorical imperatives. We leave such things to rational philosophers, and to their admirers in academia. We believe in finding one’s center, in acting out of one’s center. We believe in spontaneity — the spontaneity of the athlete, of the artist. We agree with Nietzsche that morality is a sign of decadence, that only decadent philosophers try to put human nature into the strait-jacket of Reason. Just as there has long been a rift between philosophy and religion, so too there has long been a rift between philosophy and science. Modern science depicted the universe as mechanical, cold, while philosophy tried to preserve some purpose, some meaning in the human sphere, if nowhere else. We don’t think there’s friction between philosophy and science; we embrace modern science, especially quantum physics. The discoveries of quantum physics, which baffled the hard-headed scientists who made them, dovetail perfectly with our non-rational worldview. The occult patterns that physicists have found in subatomic particles are strikingly similar to the occult patterns that we see in the world around us. Even before we became acquainted with quantum physics, we were convinced that the world wasn’t rational or logical. We’re delighted to find that quantum physics confirms our non-rational worldview. Quantum physics didn’t form our worldview, it encouraged us in it. We believe that the philosophical subject par excellence is the occult, and we’re fascinated by all aspects of the occult. Fascination with the occult is characteristic of non-rational thinkers, just as admiration for Aristotle is characteristic of rational thinkers. The thinker who interests us most, Carl Jung, was fascinated by the occult throughout his long life, and had no interest in Aristotle. We believe that the exploration of the unconscious, which began with Schopenhauer in the early 1800s, is as important for the Philosophy of Today as Eastern philosophy is. We believe that these two movements — the psychology of the unconscious and Eastern philosophy — have left a deep mark on Western philosophy, and have made this moment the most propitious moment in the history of Western philosophy. We believe that, while Freud is important for philosophy, Jung is even more important. We regard Jung as the leading exponent of the non-rational approach to philosophy. Jung’s grasp of the dark side of human nature is unsurpassed, yet he’s far from pessimistic. He not only sees the potential for spiritual growth, he argues that human nature has a proclivity for growth, for balance, for finding its center, for becoming whole. Like other non-rational thinkers, Jung and his disciples teach us to respect the wisdom of poetry, of mythology, of fairy tales. They teach us to respect that age-old wisdom that is found in all cultures and all religions, that age-old wisdom that is sometimes called the Perennial Philosophy. One might describe the Philosophy of Today as the Perennial Philosophy, or as the Hermetic Philosophy, or as the Non-Rational Philosophy. The Philosophy of Today isn’t nihilistic or pessimistic. We take a positive attitude — as Zen does, as Thoreau does, as Nietzsche does. We respect Nietzsche because he understood atheism and nihilism, and because he foresaw that we would overcome nihilism, and regain a positive attitude. We believe that Nietzsche carried on the humanistic tradition that has its roots on the Acropolis, and we believe that we’ve enriched that tradition with the help of psychology and Eastern culture. We believe that Nietzsche foresaw the flowering of philosophy in our time, and referred to it as The Great Noontide. 12. Ruskin’s Hammers John Ruskin was born in 1819, and raised in a pious Protestant household. His mother read the Bible with him, and when they got all the way to the end, they would turn back to page 1, and start again. As Ruskin grew older, his faith dwindled, partly because of advances in science, partly because of Biblical criticism. Geologists undermined Ruskin’s faith by showing that the earth was far older than had been thought, far older than the Bible said it was. “If only the geologists would let me alone,” Ruskin wrote, “I could do very well, but those dreadful hammers! I hear the chink of them at the end of every cadence of the Bible verse.”6 It was difficult to reconcile the vast age of the earth with the idea of divine providence, divine planning. If God had made the earth for man, why had man’s appearance been delayed for so long? And if God hadn’t made the earth for man, then what had He made it for? The Philosophy of Today has nothing to fear from advances in science, or from a close analysis of Biblical texts. The Philosophy of Today doesn’t try to make the world fit into the Procrustean bed of an established religion, or a holy text. The Philosophy of Today accepts the world as it is, and adopts a religious attitude toward the world; one might describe it as a religion of the world. Though Pater was attracted to the Epicureans, he wasn’t a hedonist: “Not pleasure, but fullness of life, and ‘insight’ as conducting to that fullness.”9 Pater’s worldview isn’t hedonism, Zen isn’t hedonism; meditation aims at awareness, not pleasure. But if Zen doesn’t seek pleasure, neither does it avoid pleasure; Zen isn’t ascetic. Younger intellectuals grasped the importance of Pater’s worldview. Oscar Wilde called Pater’s study of the Renaissance his “golden book.” Pater influenced the Aesthetic Movement of which Wilde was a leader. 14. Gibbon “The various modes of worship,” wrote Gibbon in the late 1700s, “which prevailed in the Roman world, were all considered by the people, as equally true; by the philosopher, as equally false; and by the magistrate, as equally useful.”10 Here we have the Enlightenment-Rationalist contempt for religion. The Philosophy of Today, which is non-rationalist, has more respect for religion, and would say, “The various modes of worship were all considered by the philosopher as equally true” (or perhaps I should say “partially true”). It is this violence against the self that Nietzsche opposed. Nietzsche declared that God is dead, and that Christian morality is also dead. Nietzsche’s arguments don’t apply to Eastern religion and morality. (Nietzsche himself, though, may have taken some jibes at Eastern religion because he didn’t understand it.) Eastern religion isn’t a traditional monotheism in which God is separate from the world, and Eastern morality isn’t a repression of the body by the spirit. The Philosophy of Today doesn’t oppose religion and morality, as Nietzsche did, it only opposes traditional monotheism and repressive morality. 16. Our Critics The Philosophy of Today will be criticized by hard-headed rationalists and by traditional monotheists, just as the Renaissance philosophy of Pico and Bruno was criticized by rationalists and monotheists. Bruno wanted to replace Christianity with a new, Hermetic religion. Bruno was burned at the stake by the Inquisition. Bruno’s worldview not only collided with the Church, it also collided with the scientific worldview that was developing in the early 1600s. This scientific worldview was concerned with the visible and measurable, and was scornful of mysticism; like the rationalists of today, these early scientists were uncomfortable with the occult and the mysterious. Because Bruno’s Hermetic worldview was opposed by the religious establishment and the scientific establishment, it went underground in the 1600s, and inspired secret societies like the Rosicrucians and Freemasons. Now the Hermetic worldview is becoming widespread once again, as it was in the Renaissance. We said earlier that Greek philosophers pioneered the rational approach, and were as fond of it as a child is of a new toy. Likewise, the pioneers of the scientific approach placed too much faith in their new methods, and were too contemptuous of the age-old wisdom of mankind, too contemptuous of mystics and alchemists. 17. Democratic Philosophy Unlike Nietzsche’s philosophy, the Philosophy of Today is democratic, and has broad appeal. We believe that Eastern practices, like meditation and yoga, can be useful for all sorts of people; these practices are effective in prisons, ghettos, etc. While Schopenhauer and Nietzsche developed a Cult of Genius, we’re more interested in spiritual growth, which is open to all, and challenging to all. Though we’re impressed by the achievements of genius, we’re also impressed by the wisdom of the unconscious — a wisdom that everyone possesses — and we’re impressed by the anonymous, folk wisdom of fairy-tales and myths — a wisdom that all peoples possess. 18. The Philosopher As Scientist Although the philosopher deals with the humanities, with man, he has much in common with scientists like Newton and Einstein, who deal with nature, with the physical world. The philosopher and the scientist both aim at truth, at constructing a picture of reality that’s more accurate than that constructed by earlier thinkers. The philosopher and the scientist both experience the thrill of discovering truth, and the pleasure of possessing a new view of the world. Those who learn this new view share in this pleasure, and see the world differently than they used to. Many, however, reject this new view and cling to the old view; the philosopher and the scientist both have difficulty persuading people to accept revolutionary theories. The philosopher deals with different branches of the humanities — psychology, politics, literature, etc. Likewise, the scientist often deals with different branches of science — mechanics, optics, astronomy, etc. The philosopher and the scientist usually arrive at their central ideas when they’re young, when they’re about twenty. The vague feelings of the child develop into the clear insights of the adolescent, and eventually become the mature work of the adult. The ideas of the philosopher and the scientist seem to have been born with them, like a part of their body. Their ideas are the ideas of their time, and couldn’t have been discovered in an earlier century. Their ideas expand on the ideas of earlier thinkers, or combine the ideas of earlier thinkers. The unveiling of Truth (center), flanked by Philosophy (left), and Science (right). 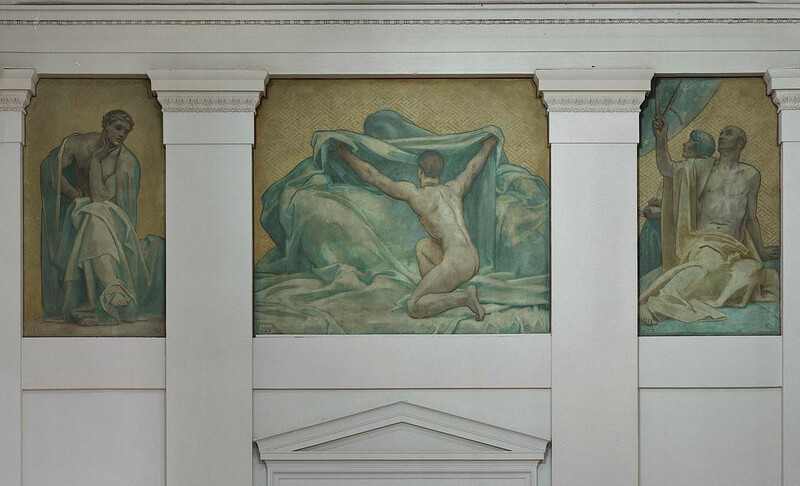 Mural by John Singer Sargent, Museum of Fine Arts, Boston. 19. The Idea of the Time During the time of Christ, one idea of the time was the repression of the unconscious; another idea of the time was the end of the world and the beginning of a Golden Age, which many thought would come soon. During the Renaissance, the idea of the time was that man, by observing and experimenting, could understand the natural world; thus we find a fascination with the natural world in Bacon, Descartes, Leonardo and Montaigne. During the late 1700’s and 1800’s, one idea of the time was atheism; the French revolutionaries, Schopenhauer, Marx and Nietzsche are examples. Another idea of the time during the 1800’s was the evolution of species; Goethe, Wallace and Darwin are examples. During the late 1800’s, the idea of the time was the psychology of the unconscious; Schopenhauer, Nietzsche, Charcot, Janet and Freud are examples. During the twentieth century, the idea of the time was the philosophy of history; Spengler, Sorokin, Toynbee and Ortega are examples. 20. Intuition There aren’t any completely original thinkers. The planting of an idea is done by a thinker’s predecessors. Once the idea is fully developed, it becomes the idea of the time, and often more than one thinker takes a hand in the harvest. A philosopher’s most profound ideas are reached by intuition, not by reasoning. A philosopher’s most profound ideas usually come to him during his youth. A philosopher is one who, while still young, has an intuitive perception of the idea of his time. Schopenhauer enjoyed worldwide fame in the latter half of the 1800s, when it seemed that he had surpassed earlier philosophers. At the end of the 1800s, however, Nietzsche eclipsed Schopenhauer, and Schopenhauer began to sink into obscurity. More than any other philosopher, Nietzsche inspires young people, and Nietzsche is the model that young philosophers strive to attain. But few people understand Nietzsche’s chief theories — his theory of decadence, and his theory of morality as decadent. Before a philosopher can be surpassed, he must first be understood. Our time can surpass Nietzsche with the help of the great psychologists who came after Nietzsche. We can see further than Nietzsche by standing on the shoulders of giants. 22. What is the origin of philosophy? According to Aristotle, philosophy originates in awe. Aristotle had in mind the pre-Socratic philosophers who speculated about the stars, the earth, etc. Aristotle supposed that these men had been prompted to philosophize by a feeling of awe and astonishment in the presence of the universe. Philosophers still feel astonishment, but this feeling is now more likely to be prompted by man than by the stars; the modern philosopher is a humanist rather than a scientist, a psychologist rather than a physicist. The modern philosopher is astonished by the powers of the unconscious, by historical events, by artistic works, and by other human phenomena. But the philosopher isn’t motivated by awe alone, he’s also motivated by an interest in the problems raised by earlier philosophers. Every philosopher starts where the last philosopher left off. Another driving force behind philosophy is suffering; the philosopher is motivated by the desire to overcome suffering, by the desire to make life palatable — for himself and for others. And finally, the philosopher is motivated by a life-instinct, a half-conscious, half-unconscious urge to improve the world and to benefit mankind. This urge motivates not only philosophy, but also many kinds of cultural and political behavior. 23. From Physics to Psychology The pre-Socratic philosophers looked at the universe, and tried to reduce the multiplicity of the universe to a single physical element — for example, to water, air or fire. Modern philosophers, on the other hand, look at man and try to view human nature in terms of a single psychological element — for example, a will to life, a will to power, or life- and death-instincts. While the pre-Socratics resembled physicists, modern philosophers resemble psychologists. While the pre-Socratics studied the world without, modern philosophers study the world within. 24. Metaphysics from Parmenides to Schopenhauer Everyone knows that metaphysics has played an important role in Western philosophy, but few know what it is. What is metaphysics? What is its purpose? How did it originate? Metaphysics originated with the pre-Socratics, with Parmenides in particular. The history of Western metaphysics is foreshadowed in Parmenides. Parmenides saw that all things changed, that all things came into being and then passed away. Parmenides reminds one of the Persian king, Xerxes, who stood on a hill and watched his huge army pass beneath him, and then wept at the thought that in a hundred years no trace of that army would remain. Parmenides sought something that really existed, something solid, stable and permanent. Parmenides decided that all particular things emerged from a primary being, and that while particular things were unstable and fluctuating, being itself was static and permanent. According to Parmenides, particular things didn’t actually come into being, since being was unchanging, nor did they cease to be; rather, particular things became manifest, then faded from view. Parmenides said that true being was permanent, and could be known only by reason and intelligence. The world of particular things, on the other hand, was illusory and was perceived by the senses. The senses were mortal and perceived what was mortal, while reason and intelligence were immortal and perceived what was immortal. Parmenides’ theory is highly abstract; if philosophy is an evolution from the abstract to the concrete, as Hegel said, Parmenides represents an extreme of abstraction, the starting point of philosophy. Plato, like Parmenides, regarded the world of particular things as illusory. Plato said that true being lay in the world of ideas; the ideas were eternal, akin to God. Most people, according to Plato, lived in the world of the senses, not the world of the ideas. Plato said that those who live in the world of the senses are like people imprisoned in a cave who know nothing of the world except the shadows they see on the walls of the cave. Plato’s metaphysics was poetic and metaphorical. Aristotle considered metaphysics to be “first philosophy,” the most important and lofty branch of philosophy. Aristotle said that true being was unchanging and undivided, just as God was; the knowledge of true being was identical with the knowledge of God. Aristotle equated metaphysics with theology. At the center of Aristotle’s philosophy was metaphysics, and at the center of Aristotle’s metaphysics was God. Hence Aristotle was popular among Christian thinkers, for whom God was all-important. Aristotle’s metaphysics exerted enormous influence over medieval philosophers, especially over Aquinas. After the Middle Ages, Descartes and Spinoza continued the Aristotelian tradition, and sought to define God, and prove God’s existence, by metaphysical reasoning, reasoning that aspired to be as clear and indisputable as geometry. Kant argued that man can’t prove anything about God, about the world of true being, about the thing-in-itself. Kant said that man can only prove what relates to particular things, to the apparent world, to the phenomenal world. Thus, Kant’s metaphysics appeared to be hostile to religion. On closer inspection, however, it became evident that Kant’s metaphysics was friendly to religion. While religion couldn’t be supported with proofs, according to Kant, there was still room for religious belief. God couldn’t be proven, but neither could He be disproven. For Kant, religion was a matter of belief rather than rational knowledge. Thus, metaphysics was still an ally of religion. But the long alliance between metaphysics and religion, an alliance that began with Parmenides, finally ended with Schopenhauer. Schopenhauer agreed with earlier metaphysicians that the world of particular things, the world of the senses, was illusory. Where Schopenhauer differed was in his discussion of the world of true being, ultimate reality. Earlier metaphysicians had equated true being with God, but Schopenhauer said that true being was “will.” In inanimate matter, this Will was merely mass, gravity. In organic life, this Will was a will to life, a will to live and reproduce. What Schopenhauer called the Will was similar to what later thinkers would call the unconscious. While Kant had left room for God, Schopenhauer divided the world between Will and idea — that is, between Will and our ideas about particular things. Schopenhauer left no room for God. Thus, metaphysics ceased to be theological, and became psychological. Schopenhauer was the first uncompromising atheist in Western philosophy. But Schopenhauer’s atheism wasn’t loud and strident, as Nietzsche’s was; Schopenhauer simply left God out and put the unconscious in God’s place. Earlier thinkers had said that man was essentially conscious and rational; Schopenhauer was the first to say that man was essentially unconscious and irrational, that consciousness was only a skin over the unconscious. 25. Schopenhauer and Hegel Schopenhauer is important because he broached the problem of atheism and the problem of the unconscious, and thus set the stage for Nietzsche and Freud. During the early 1800’s, when Schopenhauer was young, Hegel was the undisputed king of German philosophy. Hegel thought that he had reached the summit of philosophical wisdom, yet in the very hall where he delivered his lectures, where he discussed how philosophy had reached its final stage, sat a young philosopher, Arthur Schopenhauer, who discovered a continent whose existence Hegel never suspected. While Schopenhauer set the stage for Nietzsche and Freud, Hegel had no influence on Nietzsche or Freud. Though Hegel was famous for his metaphysics and his logic, Hegel’s importance lies in his theory of society as an organism. This theory influenced those who, in the twentieth century, have explored the philosophy of history. While Hegel was preoccupied with history, Schopenhauer paid little attention to it; Schopenhauer overlooked history, just as Hegel overlooked the problem of atheism and the problem of the unconscious. Schopenhauer regarded history as a chain of random events, lacking philosophical meaning. Schopenhauer insisted that Hegel’s concern with history was a deviation from true philosophy. A philosopher generally thinks that he has discovered the whole truth (and his followers agree with him), but a philosopher never discovers more than part of the truth. A philosopher’s importance is often misunderstood by his contemporaries, and also by the philosopher himself. A philosopher’s importance is most apparent in retrospect, when his influence on later thinkers becomes evident. 26. Nietzsche During his early twenties, Nietzsche idolized Schopenhauer. During his early thirties, however, when he wrote Human, All-Too-Human, Nietzsche took issue with many of Schopenhauer’s views. For example, while Schopenhauer had criticized dueling, Nietzsche praised it, and while Schopenhauer had praised the study of foreign languages, Nietzsche criticized it, and while Schopenhauer had called noise an unpleasant distraction, Nietzsche called noise a pleasant diversion. Nietzsche took issue with Schopenhauer’s views in order to emancipate himself from Schopenhauer, to become a philosopher in his own right, and to become Schopenhauer’s equal. After he had emancipated himself from Schopenhauer, Nietzsche no longer felt compelled to take issue with Schopenhauer’s views. Nietzsche did, however, accuse Schopenhauer of constructing an elaborate metaphysical argument for the sake of supporting his personal opinions on morality and on the world in general, just as Nietzsche accused Kant of constructing an elaborate metaphysical argument for the sake of supporting his own belief in God and in Christian morality. Nietzsche thought that elaborate metaphysical arguments were constructed not to ascertain truth, but rather to support a philosopher’s personal opinions. And a philosopher’s personal opinions, in Nietzsche’s view, were the expression of that philosopher’s instincts. Nietzsche criticized Kant and Schopenhauer not for constructing faulty arguments, but rather for having decadent opinions and decadent instincts, and for hiding their opinions behind a facade of elaborate reasoning. When Nietzsche chose to write in aphoristic form, he rejected the tradition of German metaphysics, and embraced instead the tradition of the French aphorists. 27. Lasting Value? When we surpass Nietzsche, will we render his books worthless? When Nietzsche surpassed Schopenhauer, did he render Schopenhauer’s books worthless? What value does a philosopher’s work have after it has been surpassed by a later philosopher? Does it have merely historical interest, or does it have lasting value? A philosopher’s work usually has lasting value, unlike a scientist’s work, which usually has merely historical interest after it has been surpassed. Some philosophers, like Schopenhauer and Nietzsche, set forth one central idea, and extend the boundaries of human knowledge. But their work doesn’t consist only of this central idea, it also contains numerous other ideas. Many of these other ideas have lasting value, even if the central idea is surpassed by later thinkers. Schopenhauer’s remarks on style, for example, have lasting value, even if his theory of the unconscious has been surpassed by later thinkers. Other philosophers, like Emerson and Thoreau, don’t set forth one central idea, and don’t extend the boundaries of human knowledge. Their work is timeless, and can’t be surpassed. They emphasize the spiritual rather than the intellectual. One might compare philosophy to a stool with three legs: Spiritual, Intellectual, and Literary. While Schopenhauer and Nietzsche emphasize the Intellectual and Literary, Emerson and Thoreau emphasize the Spiritual and Literary.